Home / Blog / Dry Toner, HP Indigo / Our Digital Deck has arrived! Our Digital Deck has arrived! Title: Our Digital Deck has arrived! Printed by: Bambra Press (VIC). Advance Mailing Solutions (VIC). CMYK Online (VIC). Composite Colour (VIC). Collation: Northern Tag Stringers (VIC). If you would like to step through this doorway please. Soon, you will enter the world of digital printing and dry toner technologies. There are lasers, line screens and precision crafted instruments galore – they could be dangerous so mind your head and watch your step. Ok, enough indulgence. There actually is a point here! Our brand spanking new Digital Deck has arrived, complete with whacky fluoro string art to make any 80s child brim with pride. 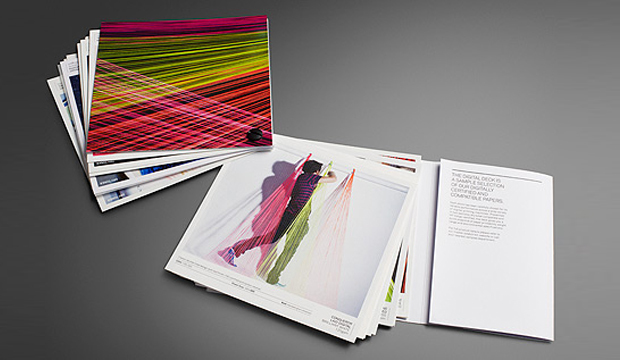 The fluoro string images that make-up the creative for our Digital Deck were created by Seesaw (VIC). 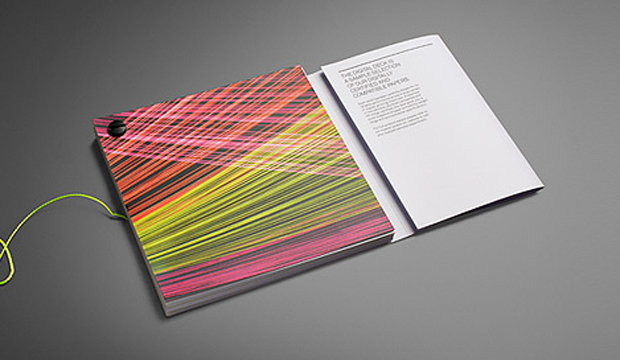 The inspiration came from research into the world of digital printing – the lasers, precision tools etc. They created string art as a tactile response and link between the paper and digital worlds (for a behind-the-scenes look at the development of this imagery, check out our YouTube channel). 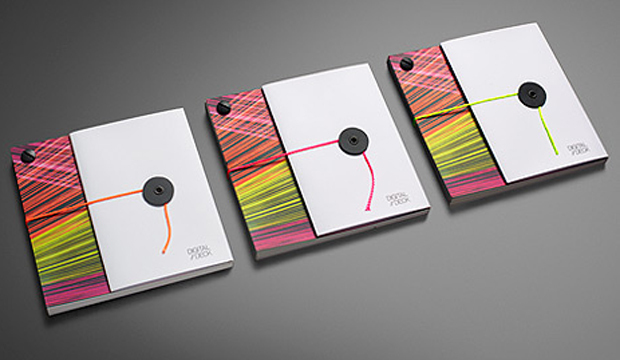 We’ve sectioned the Digital Deck into two parts – Dry Toner and HP Indigo. The stocks featured have been carefully selected for their performance capabilities. A compatibility chart is featured on the inside cover. The left column is for dry toner products and the right lists the Indigo papers. The table shows each of the featured stocks, their environmental credentials and compatible weight ranges. As you move through the deck and see the narrative unfold, you’ll notice that each page clearly lists the machine and stock description/info. Samples of both text and cover stocks appear in the deck. The stocks featured include: Barry Bleach Board Digital / Color Copy – Uncoated / Conqueror Laid Digital / Curious Metallics Digital / EnDURO / JAC Digilabel / Knight – Smooth (dry toner) / Knight Digital – Indigo / Maine Recycled Digital – Gloss / Maine Recycled Digital – Silk / PicoFilm / Rives Design Digital / Sovereign A2 Digital – Gloss / Sovereign A2 Digital – Silk / Sovereign Offset (dry toner) / Sovereign Offset Digital – Indigo. A particular highlight is the new Knight and Sovereign Offset digital papers. Both are high white papers that are well priced for their class and offer exceptional press results, specifically for dry toner and HP digital applications. Also, they are identical to their offset versions in shade and finish which is a bonus for customers that need to match communications across offset and digital technologies. Our journey in creating this deck was a learning curve, even for us. We soon realised the importance of working closely with the press operators to ensure they had profiled the stock correctly and weren’t just using a generic profile. 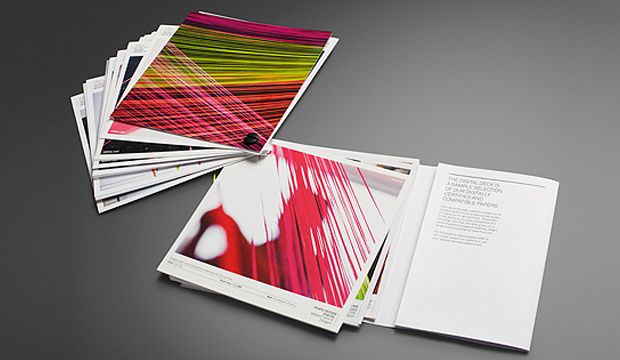 To get the best result, especially when working with textured papers, is setting up the profile to suit the paper. 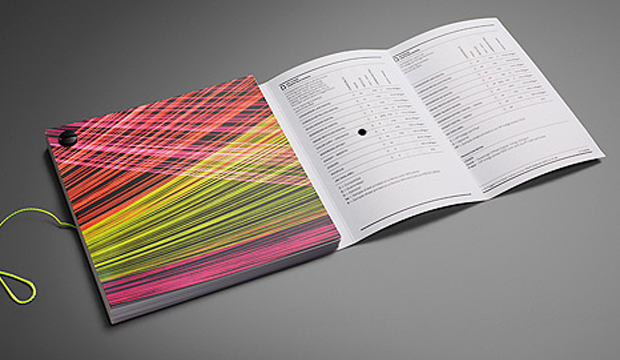 When a digital machine is set-up properly, excellent print results can be achieved.